Ed. Note: The following op-ed is written by David A. Clarke Jr., sheriff of Milwaukee County, Wisconsin, and Jonathan Thompson, CEO of the National Sheriffs’ Association. For the fifth year in a row in 2014, ambush attacks on police officers were the No. 1 cause of felonious deaths of law enforcement officers in the line of duty. Nevertheless, Google continues to market a smartphone application that lets lawbreakers pinpoint the location of police officers in the field. Google’s executives won’t even discuss the subject with organizations representing law enforcement. Google’s popular real-time traffic app, Waze, uses GPS navigation and crowdsourcing to alert users to traffic jams, automobile accidents, stalled cars, and through its “traffic cop” feature, the presence of law enforcement. 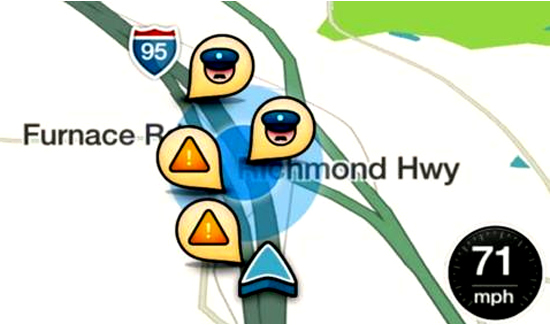 Most people undoubtedly use Waze’s police-finding feature to avoid traffic tickets, but the app poses an enormous risk to deputies and police officers. In the days before he assassinated New York police officers Rafael Ramos and Wenjian Liu at point blank range while they sat in their patrol car last December, Ismaaiyl Brinsley is known to have used the Waze application to monitor the movements of police officers. The killer identified the location of police on his own Waze account and even posted screen captures to Instagram.